Road Kerb strengthens the concrete paving edges. The road kerb is used by building the roads and Parking places in order to differ one surface form another when they are used by different kind of transport. It is also used as an element to mark the elevated areas and pavements. This form of kerb edging is normally only found on large road schemes, such as motorways and dual carriageways. The kerb is formed from concrete or asphalt and is produced by machine, usually as an adjunct to the surfacing work. They are more common on the long straight, monotonous roads Extruded concrete kerbs are usually formed by the use of specially shaped plates fitted to a Slip-Form Paver machine which then creates the kerb as it progresses along the carriageway. Extruded asphalt kerbs are commonly formed in a special extruding machine and are bonded to the existing asphalt surface. Half-battered or splayed profiles are the commonest forms used on highways in Britain and Ireland. Adjustments to line and level of extruded kerbs is a bit of a chore, and for that reason, they tend to be used primarily on long, straight, unbroken runs, rather than the twisting, winding, up-hill-and-down-dale roads we have in Britain and Ireland. Retaining the carriageway edge to prevent 'spreading' and loss of structural. Acting as a barrier or demarcation between road traffic and pedestrians. Providing physical 'check' to prevent vehicles leaving the carriageway. Forming a channel along which surface water can be drained. There are many different types of road kerbs used 50 years ago, natural stone, such as granite, was the most popular, but these have now been supplanted by pre-cast concrete. In restricted areas experiencing exceptionally heavy traffic, such as town or city centres, steel kerbs have been used to cope with the constant over-running of vehicles, and on our motorways and dual carriageways, extruded kerb lines are commonly used. Kerbs have always been heavy, cumbersome things and they take their toll on installers (as I can testify! ), and so there has been a move within the industry, spurred on by health and safety concerns, to look at various options for reducing the wear and tear on kerb-layer Along with machine-aided installation, one of the options considered is a lighter kerb, and the K-Lite manufactured by Charcon is a prime example. The kerb length has been reduced to a much more manageable 450mm, but the form of the kerb has also been altered, creating a frog (a recess) in the rear of the kerb unit, which dramatically reduces weight to just 20kg per unit. The frog is eventually filled with haunch concrete and there is no loss of performance from the completed kerbline - just fewer knackered kerb-layers! Pre-cast concrete units are now the most popular choice for kerbing. 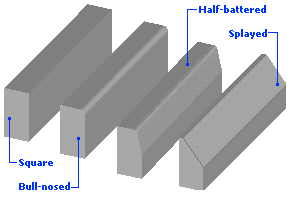 Hydraulically-pressed kerbs are strong, durable, cheap and can be manufactured to strict tolerances (BS EN 1340). There are some special shapes, notably quadrants and some droppers, which are still manufactured from vibrated concrete, although this material isn't as strong as a pressed concrete. Standard kerbs have a pimpled finish and come in a fetching shade of concrete grey. More decorative (and therefore more expensive) kerbs are becoming popular on prestige and 'Heritage' schemes, with features such as exposed aggregates and textured finishes. There are 4 basic profiles to the most common, pcc road kerbs used throughout Britain. With the phenomenal growth in the use of block paving as a paving over the last couple of decades or so, decorative small unit kerbs that complement the scale, textures and colour schemes of block paving have been developed. While some of these units are specifically developed for private driveways and the like, there are several units that are, in effect, short versions of the standard road kerb profiles, notably the half-battered, the bull-nosed and the chamfered forms. Although these units are not normally used on main or arterial roads, they are popular on the cul-de-sacs and feeder roads of modern residential estates. Where a curve or change in fall requires a joint to be left slightly open, it should be pointed with a 3:1 mortar, as described on the Mortars & Concretes page. The smaller, block paving kerb-units look tidier when pointed with a mortar of a complementary colour, with a 10-12mm joint between adjacent units. This is particularly true on slow curves where radius units are not used, but also on straight runs. The block-paving kerb units are also very useful for constructing steps or terracing, as they provide a neat and tidy solution to forming vertical faces. Channel kerbs were once a common sight at the edge of many roads, especially on carriageways where stone kerbs were used. They provided a 'gutter' for the drainage of surface water and provided a spacer between the edge of the macadam or asphalt and the face of the kerb. As pcc kerbs gradually replaced stone kerbs, pcc channels were often used in conjunction with them, but nowadays, they are rarely specified, unless they are used to create 'summits and valleys' adjacent to a relatively flat kerb line. There are other channel kerbs that are more usually laid away from the edge of a pavement as an aid to drainage. These include dished or fluted channels. They can be used within footpaths or within low-speed vehicular areas, such as car parks. A larger version of the flat-bottomed dished channels is sometimes used as a combined edge restraint and drainage channel on motorways or dual carriageways. The success of linear channels has more or less seen the end of surface drainage channels for anything other than special jobs, such as the York stone pavement shown opposite. Dished channels are, rightly or wrongly, often regarded as a hazard for wheelchair users and prams, and so their use is now largely restricted to car parks, while fluted channels have virtually disappeared, despite their hardly being a week without someone asking where they can be obtained.